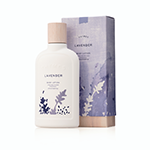 Celebrate 25 amazing years of Thymes Lavender Body Lotion! Packaged with silver accents and a silver bow, we are celebrating the silver birthday of this amazing scent. This body lotion helps to moisturize your skin and is beloved for its calming aroma. Part of the Thymes Lavender Collection.